Did Dzumhur and Mannarino accidentally play in a WTA tournament? Radwanska said that she will most likely play with limited schedule next year, skipping the clay season. Also she hinted that she'll retire soon. Viktoria Kužmová won the ITF Budapest her 6th ITF circuit title, next Monday she will be 58th in the WTA ranking, her new pb. way to go Viki ! This is the era of tennis moms - Mandy Minella reached her first WTA final in Gstaad! Easy set 2 and then in set 3 he got mad at the noisy crowd again at 2-2, then lost 4 consecutive games. @dcro Could you please stop making phone calls during tennis matches? That was a revenge for he's done at Wimbledon. 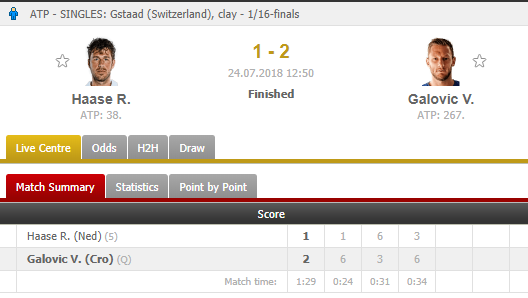 Great win for 17 year old Rudolf Molleker against David Ferrer in Hamburg, up to around 240 in live rankings, another win would bring him close to the top 200. He hasnt much to defend for the rest of the year, so maybe he can finish around 150. With him, Auger-Aliassime and Kuhn we could have 3 18 year olds entering the top 100 next season. I think in 3-4 years the top 20 will be very young with those guys + Zverev, Shapovalov, Tsitsipas, Kyrgios, Thiem and so on. Stop it with the Croats, we surrender!